FOI Man looks at new guidance issued by the Cabinet Office which appears to directly contradict the Information Commissioner. Email is a fraught subject for information managers. Take this recent (and rather excellent) blog post from records management consultant James Lappin. As James makes clear, few – if any – organisations have really got a handle on how the valuable information held in email should be retained and managed. And that’s just the email held in corporate accounts. If staff or others use their own private email accounts to conduct organisational business that creates a whole new complication. Especially if you’re a public authority and that business might be subject to the requirements of the Freedom of Information Act. Now unless you have a very short memory, you will recall that the Coalition Government has had its fingers burnt in this area before. 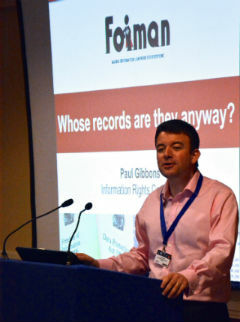 Through clever use of both FOI and the Data Protection Act (and useful leaks), Financial Times journalist Chris Cook established that Education Secretary Michael Gove and some of his special advisers (or Spads) had been using private email accounts to conduct business which appeared to many (eventually including the Information Commissioner) to be Government business. It was suggested that this had been done to avoid potential disclosure of the emails through FOI. 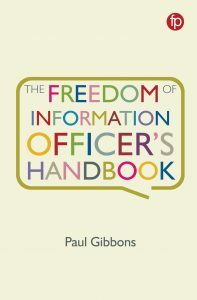 Following this controversy, the Information Commissioner issued guidance to public bodies which confirmed that email held within private email accounts could indeed be subject to FOI, and what his approach to this tricky issue was. If I were a Government that had been accused of trying to avoid proper and lawful scrutiny through the use of private email accounts to conduct government business, I think I might want to take a “whiter than white” approach to these matters in future. I’d want to make sure that I followed the Information Commissioner’s line on the issue to the letter, so that nobody could put so much as a hair between my approach and that of the regulator. That seems sensible doesn’t it? So imagine my surprise as I read the Cabinet Office’s new Guidance to Departments on the Use of Private Email, published perhaps less surprisingly late last Friday afternoon. The guidance starts off by pointing out that it should be read in conjunction with the Information Commissioner’s guidance. So, obedient to the last, I’ve done just that. Let’s see what they say, shall we? Now to be fair to the Cabinet Office (no, come on), some may see these differences as subtle and perhaps it is only my world-weary cynicism that leads me to see conflict. But the final section of the Cabinet Office guidance dealing with The Freedom of Information Act and searches for information sees the Cabinet Office take a running jump away not just from the Information Commissioner’s guidance, but also from any reasonable interpretation of the legislation itself. I’m sure that it’s just a coincidence that Chris Cook has made a spate of requests to the Cabinet Office and Department for Education asking for information sent by individuals on Government business using private email accounts. Surely the Cabinet Office couldn’t be so touchy as to write a policy just to thwart the efforts of a single journalist? But the point is that FOI doesn’t place any limitations on the way that requesters should ask for information. They merely have to describe “the information requested” (FOI, s.8). If that description happens to include the location that they believe the information can be found in, the only reasons why a public authority would not be obliged to provide that information is if an exemption applies to it, if the request is considered to be vexatious, or if to provide the information in that location would exceed the appropriate cost limit. But you don’t have to take my word for it. 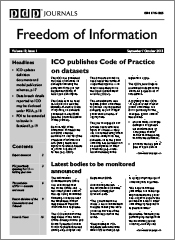 The Information Commissioner’s Office issued a decision notice (not yet available on the ICO website) to the Cabinet Office the week before this guidance was published making exactly the same point. Chris Cook had made a request for “copies of emails relating to the government’s education reforms, sent between the Prime Minister and a special adviser, using non-GSI email accounts”. Given the events described above in relation to the Secretary of State for Education, it can perhaps be understood why such a request might be made. The Cabinet Office argued (as in their guidance) that FOI did not allow requests for information by reference to a particular location or medium, and that Chris’s request was therefore not a valid request. The Information Commissioner concluded that Chris’s request was indeed valid for the reasons I’ve suggested above. So the week after the Information Commissioner has explicitly stated to them that a request for information held in a specific location is a perfectly valid request, the Cabinet Office have published official guidance to Government departments contradicting the Commissioner’s view. Not for the first time, this Government appears to be interpreting the law to suit itself in the face of all the facts, and raising a single finger in the direction of the Information Commissioner. The Cabinet Office might like people to believe that they have only have the right to “to request information” but in fact in most cases we have the right not just to request but also to receive. Positively dangerous and shoot-in-the-foot approach by CI. It is often the case under the duty to advise and assist, particularly where negotiating what may be reasonable within the costs limit, that an authority will ask a requester to agree to limit request to e.g. searches in certain locations. You cannot reasonably do that if you do not allow same luxury to the requester.